Hatsune Miku is more than a little big in Japan. She appears on billboards, in TV commercials, and gives sold-out concerts to legions of fans the world over. Of course, being a popular singer in and of itself isn't something that out of the ordinary. However, what makes her unique is the rather large obstacle she had to overcome in her path to fame—namely that Hatsune Miku isn't even a real person; she's a computer program. Yet, despite her unquestionable commercial success, the creation of the world's first major virtual idol didn't begin as a ploy by an ambitious record label. Rather her creation came along largely as a random fad—a fad capitalized upon by both fans and companies alike that catapulted her into super-stardom. In 2004, Yamaha Corporation developed a singing synthesizer program known as Vocaloid. By entering in a melody and the lyrics of a song, the program is able to then sing the song for you using a synthetic voice. The singing voices themselves, however, were not made by Yamaha. Instead, other companies would create their own programmable singers and release them as an individual product. There were many unique virtual singers before Hatsune Miku—coming from many different companies—but none of them spread beyond their intended audience of composers. Miku was different. At the time of her "birth," she was little more than a character design to be used for box art—the sum total of her backstory called her "an android diva in the near-future world where songs are lost." Yet her character design was tailor made to excite Japanese otaku. Mixing moé with cyberpunk, Miku made her version of Vocaloid 2 stand out from the normal-looking software surrounding it on the shelf. But the best design in the world wouldn't have been enough if she didn't have the voice to match. Using samples of Japanese voice actress Saki Fujita, Crypton Future Media made a cute voice comparable to the most popular of Japanese pop-stars. Her voice software was such a hit that Crypton Future Media was unable to keep up with the demand immediately after its release—an unprecedented feat for similar composing software in Japan. With Miku's Vocaloid 2 in the hands of more people than any singing software before it, Miku was primed for her big break. The internet was happy to oblige. "Ievan Polkka" by Nico Nico Douga user Otomania spread in a viral wave across the web. Soon people who had never even thought about the existence of voice synthesizing software were buying copies of Miku's Vocaloid 2. Thus began the flow of new songs. And because of the ease of creating songs in Vocaloid 2, original music flooded the net as did scores of Hatsune Miku covers of popular Japanese songs. Fan translated covers of famous Western game music—like Portal's "Still Alive"—flowed through the Japanese side of the net as well. But adding thousands upon thousands of new songs was merely the beginning of the fan community's support. Within two years, the fan-made program Miku Miku Dance was created to add choreography to Hatsune Miku's library of songs—adding yet another layer to the Hatsune Miku fanbase. Yet it's doubtful that Miku's popularity would have continued to grow without corporate support in addition to the fan support. In the years since Miku's Vocaloid 2 release, many different talented people have been hired from across the net to produce more and more original Miku music. Moreover, Crypton Future Media released an add-on to Miku, giving her voice a wide range of emotions to suit different types of songs. But perhaps the greatest reason for Hatsune Miku's success is that at some point she stopped being looked at as a software program and started being treated as a legitimate popstar. In 2009, Miku even held her first live concert. 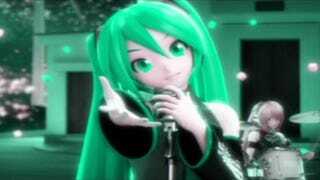 Using a 3D hologram technology (much like that used in Tupac's recent return), Miku is able to sing and dance for sold-out crowds of adoring fans. Also like many celebrities, Miku has become a corporate spokesperson—going so far as to sell cars in TV commercials. Miku's virtual status has allowed her to easily move into forms of media often ignored by real-world idols. In 2009, Sega began releasing Project Diva, a music game series starring not only Miku but a large collection of other Vocaloid characters as well. There are currently six games in the series with a seventh planned for later this month. Hatsune Miku has come a long way since her humble roots as a piece of composing software. While not originally intended to be anything like what she has become, a mixture of luck, fan creativity, and corporate support have turned her into the world's most popular virtual idol. The story of her evolution is an interesting one. But now we are left with the question, is Hatsune Miku a one-of-a-kind success story, or has she opened the flood gates for a music industry full of virtual idols? Only time will tell.